I’ve just returned to the hotel after watching the start of the fourth round. I’m in a state of shock. 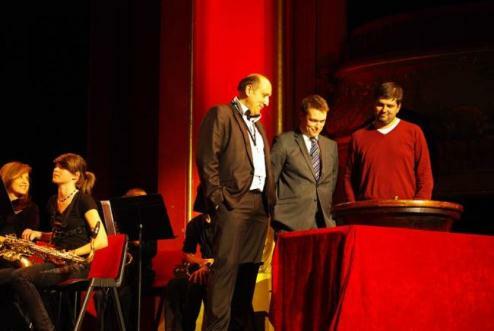 At the tables I said hello to the five-time Russian Champion Peter Svidler, then I had a look at his game – and was dumbfounded. The move 1. g3 had been made on the board, and his opponent – the Greek grandmaster Mastrovasilis – was spending a long time studying the position and, it seems, couldn’t believe his own eyes. No doubt he’d been preparing from yesterday evening to lunch today for the normal 1. e4, had unearthed a couple of deep saving resources – and then he gets an incredible surprise like that at the board. He sat there, trying hard to think, and simply wasn’t able to find a decent reply. But on the other hand, why not? The guy had the urge to simply play chess – to leave the beaten paths and recall his youth. After all, in our childhood all of us, out of ignorance, played mischievous setups in which you had to start thinking from the very first move. And everyone will confirm that was the happiest period of their life. So why not try to recover at least a fraction of that carefree past? That truly is happiness – not to have to cram up on a ton of variations in the morning before the next round, not to have to study new games, not to have to sit at the computer expecting miracles from chess engines. It brings to mind the English grandmaster Matthew Sadler, who gave up chess with the words: “I got bored of each morning struggling with the dilemma – what should I play against the Grunfeld?” But there’s no need to suffer! 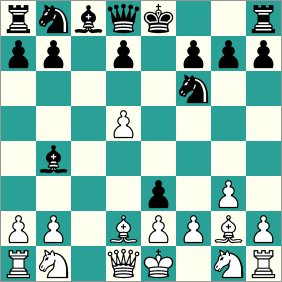 You should go with your mood and make the move 1. g3 (or 1. a3, 1. b3, 1. e3, 1. Nc3 and so on), enjoy the astonished face of your opponent and simply play chess. After all, none of us has made a life-long pact with the devil to play only the same openings. Karpov, from his childhood on, played 1. e4 and couldn’t have known that in the second half of his career he’d only play closed openings. Kramnik, on the contrary, preferred 1. Nf3 and 1. d4, but then suddenly took on the role of a crusader knight of Sicilian attacks (true, not for long). Nowadays, the changing fate of openings forces many to seek refuge from theoretical impasses in completely unknown and unexpected openings. In the end, the dominance of computer lines forces creative players to look for absolutely offbeat paths, where their apparently all-knowing opponents have to rack their brains right from the opening. So Svidler’s right. The future belongs to 1. g3! Unfortunately the last joke doesn’t work in English. What I’ve translated as “offbeat” is literally something like “leftist”, while “right” also has two meanings in Russian. So Shipov says: “everyone has the right to go left”! I hope to translate Sergey Shipov’s future letters from the event, and also catch up with the first three, but for now here’s the indisputably offbeat game, Peter Svidler – Athanasios Mastrovasilis. A quick computer check suggests it’s better to respond to the 7…e3 novelty with 8. fxe3, while in the game 9…Na6 might have given Black reasonable chances. Well-spotted! So the …e3 idea without …cxd5 first. I wonder if the players knew about it beforehand? The idea doesn’t seem so bad, but it can obviously go completely wrong for Black very quickly. ChessGirl, yep, I should probably add a footnote :) For non-Russians… the Russian word for the chess piece the English call a bishop is elephant. And in Hindi (India), the rook is called an “elephant”, and the bishop is a “camel”. In American English, one could say, “Everyone has the right to be out in left [field]” or something along those lines. I fail to see what is so fantastic about this. 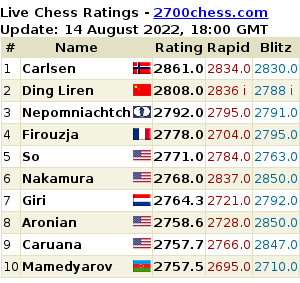 After only two moves each they have reached a well-known position. It was just a transposition of moves. The point’s simply that it’s Peter Svidler we’re talking about, and he has one of the most classical opening repertoires around. A quick look at the Chessgames database suggests Svidler’s never (!) played 1. g3 before. That’s in a probably-not-complete list of 893 games he’s played with White. He’s played 1. c4 29 times, but the game above seems to be the only one to include c4 & g3 as the first two moves. So Svidler playing 1. g3 really would have come as a shock to his opponent – and Shipov! Misha, just a short note to thank you for the many, many translations you’ve given us that are a joy to read. You took a piece of excellent writing (Shipov’s) and turned it into sparkling, idiomatic English. I like the way you deftly handled the translator’s note (complete with Youtube link) and then tacked on the footnote about налево and its connotations. More from the translator would have been obtrusive, less would have deprived us of the chance to learn something about Russia’s culture and language. Samy Shoker of Egypt played only 1.g3 and has now become a Grandmaster playing 1.g3 throughout his career and not just a surprise weapon In 2011 World team Championship Samy shoker defeated GM Shakhriyar Mamedyarov 2765 of Azerbaijan, GMAlexander Areshchenko 2682 of Ukraine,drew with GM Evgeny Postny of isreal 2618,drew with Gabriel Sargissian of Armenia 2663, drew with GM Peter Svidler of Russia 2739, drew with GM Li Chao of Chine 2669, with losses to Polgar, Ganguly and Hess to score Score: 4-5 (GM norm, 2675 opposition, 2632 TPR) (www.akinov.blogspot.com) The question then is what does it take to be good at playing this opening? ?